QS World University Rankings 2014 announcement lists 10 Pakistani universities among Asia's top 300. South Asian institutions featuring on this list include 17 from India, 10 from Pakistan and 1 each from Bangladesh and Sri Lanka. The list is topped by Singapore with its National University at #1 and includes Singapore's Nanyang Technical University at #7. It is dominated by 58 universities from China (including 7 in Hong Kong and 1 in Macao), 50 from Japan, 47 from South Korea and 28 from Taiwan. Other nations represented with universities among top 300 in Asia are: Malaysia (17), Thailand (10), Indonesia (9), Philippines (5), Vietnam (3) and Brunei (1). 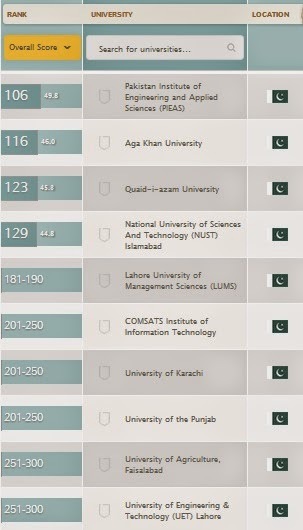 Pakistani universities on the list are: Pakistan Inst of Engineering and Applied Sciences (PIEAS) at 106, Aga Khan University (AKU) at 116, Quaid-e-Azam University (QAU)at 123 National University of Sciences and Trechnology (NUST) at 129, Lahore University of Management Sciences (LUMS) at 180-190, COMSATS Institute of Technology at 201-250, Karachi University (KU) at 201-250, Punjab University (PU) at 201-250, University of Agriculture Faisalabad (UAF) at 251-300 and University of Engineering Technology (UET) Lahore at 251-300. Rise in international rankings of Pakistani universities began during Musharraf years when the annual budget for higher education increased from only Rs 500 million in 2000 to Rs 28 billion in 2008, to lay the foundations of the development of a strong knowledge economy, according to former education minister Dr. Ata ur Rehman. Student enrollment in universities increased from 270,000 to 900,000 and the number of universities and degree awarding institutions increased from 57 in 2000 to 137 by 2008. Government R&D spending jumped seven-fold from 0.1% of GDP in 1999 to 0.7% of GDP in 2007. Although still a young institution, CIIT has gained a strong reputation in the region for its research and teaching especially in the fields of IT and computer science, and CIIT is highly placed in regional rankings as a result. The Islamabad campus is home to over 5,000 students while around 30,000 more attend classes at CIIT’s satellite campuses in Abbottabad, Attock, Vehari, Lahore, Wah and Sahiwal. The university offers a wide range of degrees at postgraduate and undergraduate level. Subjects are split into nine departments which between them offer almost 100 degree programs. Teaching at CIIT takes place in English and the comparatively low cost of tuition makes this an attractive option for international students wishing to specialise in information technology or computer science. The university was founded in collaboration with the military and military and civil educational establishments merged to become NUST. Since its creation, the institution has grown student enrolment and broadened its curriculum to include non-STEM subjects. NUST consistently performs well in the regional rankings for the quality of its electric engineering department, the university also ranks highly among those from other emerging economies. Students can choose from a wide array of undergraduate, postgraduate and doctoral programs from over 20 departments. The university has in the region of 15,000 students encompassing many different nationalities. NUST also has close links with a great many international organisations such as Stanford and Caltech in America, the university of Manchester in the UK and the Tokyo Institute of Technology, among many others. The university also collaborates with CERN, Intel and Microsoft in research and training. The university offers a broad mix of subjects from 38 academic departments spread across its four faculties. The faculty of natural sciences is home to the maths, physics and computer science departments among others. The faculty of social sciences houses law, history and economics, the faculty of biological sciences has medicine, biochemistry and microbiology. Finally the faculty of medical science is home to dentistry, nursing and the university eye hospital.